Official Bankruptcy Forms: Do You Know What Is Missing? You are here: Home / Chapter 7 Bankruptcy / Chapter 13 Bankruptcy Forms: Do You Know What Is Missing? Chapter 13 Bankruptcy Forms: Do You Know What Is Missing? In any chapter 13 bankruptcy filing where the debtor is going to be on payroll control, the official forms should have a check box which indicates whether a payroll control or payroll authorization form should be printed. The form would automatically populate the debtor’s employer information taken from schedule I, the amount of the monthly payment pursuant to the plan and an indication to contact the debtor’s attorney by phone or email to determine where the withheld funds should be submitted. This would work tremendously better than the current system that we have in place. Under the current system, the debtor’s attorney prepares a payroll control order which is then submitted to the assigned judge for his or her signature. From there the signed order is submitted to the chapter 13 trustee. The chapter 13 trustee then sends the order along with a cover letter to the payroll department of the debtor. Shortly thereafter or sometimes never will the payroll department actually deduct funds and tender those funds to the chapter 13 trustee for distribution. This process of submitting a document, a perfunctory document no less, to the judge, to the trustee, to the payroll, is a long, burdensome process that often fails. Under my plan, the payroll control order or payroll authorization would be part of the official documents much like an automatic stay. In other words it wouldn’t need the judge’s signature to advise the debtor’s payroll to start deducting pursuant to a duly filed plan. Since the document would be electronically filed, it would have an official date and time and case number stamp at the top of it. There would be no concern as to whether or not the payroll control or payroll authorization order was valid. This would give debtors a greater chance of success and debtors attorneys a greater reward for the hard work that they do in an effort to get the case confirmed. Now I know that some judges will say, “well the burden is on the debtor to make the plan payments until such time that they see it coming out of their check.” In fact, my office appeared recently in front of a chapter 13 judge in an attempt to hold a corporation in contempt of court for completely ignoring this judge’s federal court order to deduct from the debtor’s wages. Surprisingly, the judge had no concern that the order was completely ignored. Instead the judge stated “it was the debtor’s responsibility to make the plan payments.” Now while this is a true statement by the judge, a signed payroll order by that judge should have some weight. I guarantee you, if other orders by that judge for different requests other than payroll control were ignored, there would be a further hearing before that judge for potential contempt. So it seems the judges don’t give a lot of weight to their own signature on the payroll control orders. For this reason and others, we could bypass the entire payroll control order request by simply making it part of the official bankruptcy forms. Lastly, the purpose of chapter 13 is to reorganize debt and to see that creditors get paid either all or a portion of their debt over an extended period of time. 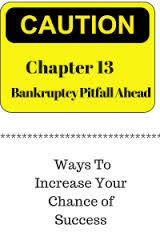 Judges, bankruptcy attorneys, creditors, and anyone tangentially associated with chapter 13 are fully aware of the low success rate with regard to chapter 13 bankruptcy cases. Why don’t we do everything in our power to effectuate a positive change so that more cases can succeed? I have seen too many cases fail due to a payment default with the trustee when the debtor was on payroll control. By making the payroll control or payroll authorization order a part of the official bankruptcy forms, we can cut down on the number of failed cases as a result of payroll not following the order or not following the order timely.